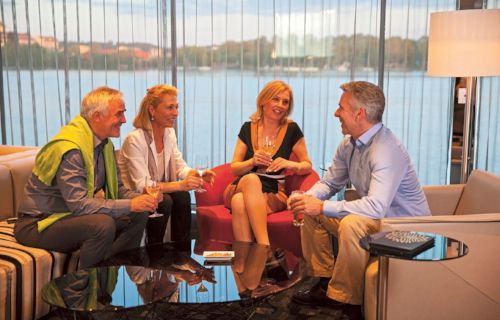 The heart of the ship, Panorama lounge and bar is where guests can relax, catch up with new friends and enjoy the evening's entertainment. The bar's always open and there's tea and coffee making facilities. Brand new for our 2017 Bordeaux, Rhone and Saone River Cruises in France, Scenic is offering guests the chance to learn how to whip up local recipes in our exclusive, private Scenic Culinaire cooking classes. The Panorama Deck holds prime position at the front of the ship, where guests can chart their course in comfort. Protected from the elements, guests can lap up to the al fresco atmosphere with a fortifying snack or thirst quenching beverage. Literally on top of the world, guests can happily spend hours lost in a book, enjoy the Teppanyaki BBQ or simply soak up the views. With plenty of comfy seating and a walking track for those active guests, there's an option for everyone. Guests can watch the unfolding tapestry on Europe's beguiling landscape float by as they enjoy the Scenery from the Riverview Terrace. By offering a butler to every guest, Scenic offers an exceptional level of service combining 5-star quality with personal attention to detail. Unwind with a nurturing massage, visit the hairdresser or enjoy a deluxe treatment. The wellness area is an opportunity to pamper and luxuriate. Energized guests can take advantage of the cardio and wight equipment in the fully appointed fitness centre.